Kidderminster Harriers chief executive Colin Gordon says that the idea of bringing back former manager Steve Burr to Aggborough on the same budget would simply not be affordable. 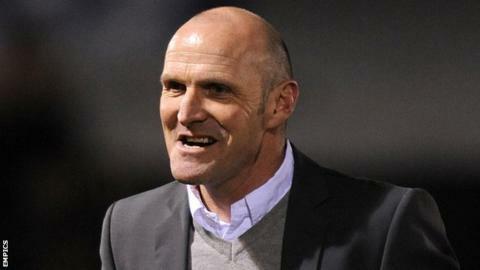 Burr, 56, was sacked by fellow National League side Chester on 7 April. Harriers are close to relegation to National League North, lying 11 points from safety with four games to play. "When Steve was here we had a completely different budget - five times what we've got now," said Gordon. Burr had four successful years as Kidderminster manager, leading them to the National League play-offs in 2013, but was sacked in January 2014. Within 11 days he had taken over at Chester, where he spent more than two seasons operating on a strict budget at the reborn supporters-run club. "It's easy to go back in time and remember when things were really sweet and smelling nicely," continued Gordon. "I like Steve. He's a great guy. I love the fact that he wants to play open football. But we are past the time when we had the wage bill to attract top players who can affect results. "The fact of the matter is that what we need now is a different type. "We know where we want to go and how we want to take things forward. We're not going backwards. We know what we want to do and people have got to trust us." Ex-footballer turned players' agent Gordon, who initially joined the Harriers board as football development director in April 2015, has run the first team at Aggborough for the majority of the season. But, having invested his own money into the troubled club, he has stated that he does not want to carry on picking the team. Kidderminster's two late goals to win 2-1 at Welling United ensured that they avoided being relegated on Saturday, although it looks like being only a temporary reprieve. Colin Gordon was talking to BBC Hereford & Worcester's Steve Miller.